Looking for a new strawberry dessert? For a light and refreshing summertime treat, Strawberry Chiffon is hard to beat. Made with fresh strawberries, seedless raspberry jam, lemon juice, sour cream and a bit of sugar, this cool and creamy chiffon recipe is sure to become a family favorite. Top each fluffy, fruity serving with additional strawberries for a very-berry delightful dessert at your next backyard BBQ. In small bowl, sprinkle gelatin over cold water. Let stand 5 minutes to soften. Set aside six whole strawberries for garnish. 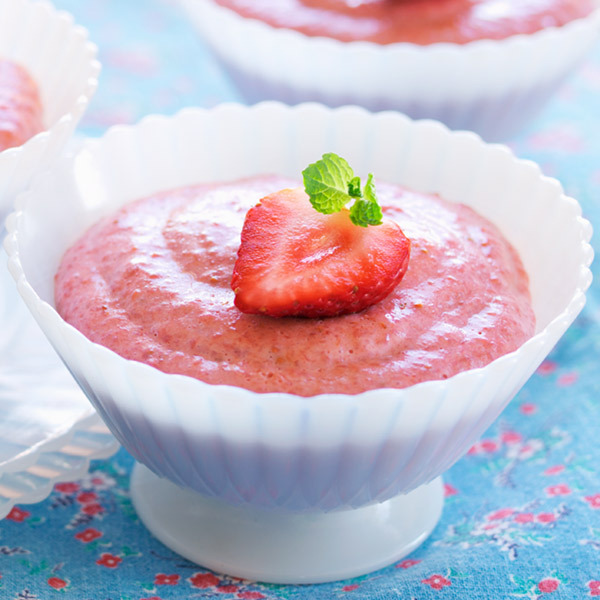 In food processor, puree remaining strawberries, jam, sugar and lemon juice until smooth. Measure out 1 cup strawberry puree, place in small saucepan, and bring to a boil over medium heat. Stir in softened gelatin and cook, stirring, until dissolved, about 3 minutes. Transfer strawberry-gelatin mixture to large bowl and stir in remaining strawberry puree. Let cool to room temperature, and then refrigerate until thick enough to mound slightly on a spoon, about 3 hours. In small bowl, whisk sour cream to loosen, and then gently fold into strawberry mixture. Serve garnished with reserved berries.